Item # 298430 Stash Points: 1,995 (?) This is the number of points you get in The Zumiez Stash for purchasing this item. Stash points are redeemable for exclusive rewards only available to Zumiez Stash members. To redeem your points check out the rewards catalog on thestash.zumiez.com. Toy Machine lovers and anarchists alike can rally around the War &equals; Death Flag from Toy Machine. A nylon 3 by 5-foot Toy Machine Skateboards Flag will look rad indoors or out. 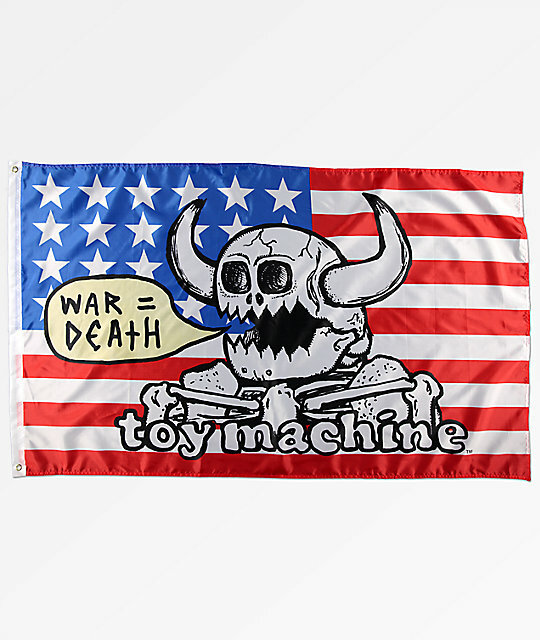 War &equals; Death Flag from Toy Machine. Red, white & blue color scheme w/ stars & stripes design. 2 brass grommets on heading for durability.